Firefighter Keith Evans said the fire "melted" the window glass. 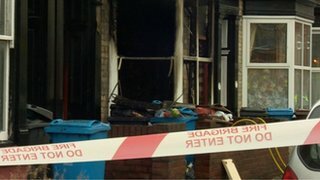 A man is in hospital after a fire at a house in Hull, which the fire service said was "so intense that it melted the glass of the front room window". Humberside Fire and Rescue were called to the property on Grove Street at about 14:00 GMT on Saturday. Some of the occupants had escaped onto the roof through a roof light. Keith Evans from the fire service said: "We were able to secure those individuals until it was safe to bring them back down through the building." Mr Evans said an adult male was taken to hospital suffering from smoke inhalation, and three others who suffered smoke inhalation refused treatment.